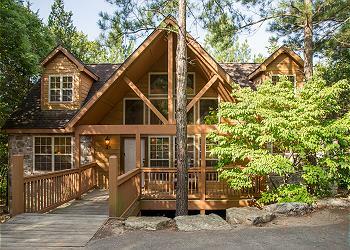 Take a step into perfect relaxation when you stay in this charming 2 bedroom, 2 bath vacation rental lodge! 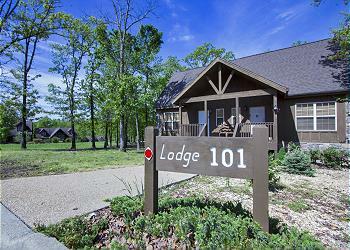 Why Rent our Cabins near Branson MO? 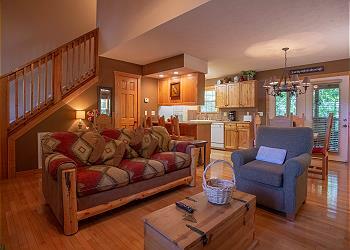 Our Branson cabin rentals come in all sizes for any type of vacation you are planning. 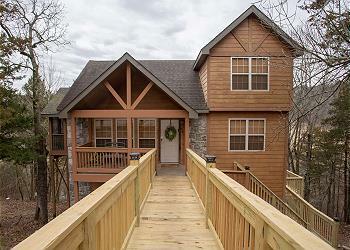 Rent a 4 bedroom, 4 bath cabin for a family reunion at Christmas. Built of stone and wood, the memories created here will last a lifetime. Spend your days attending shows in town, your nights experiencing the twinkling light shows Branson has perfected, and sleep cozily tucked away in a rustic cabin straight out of a movie set. With a fire roaring merrily in the stone fireplace, tell the story of The Night Before Christmas to your entire family as you drink hot cocoa and mulled wine and celebrate all that is wonderful about the holiday season. Or watch your favorite Christmas movie on one of our big screened televisions as you sneak a peek at your social media page during the slow parts; complimentary Wi-Fi is included - rustic doesn't have to mean backwoods, you know! 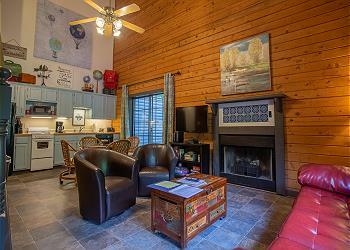 Stay in one of our great Branson cabins and make the most of your vacation! Planning a Golf Weekend with your College Friends? 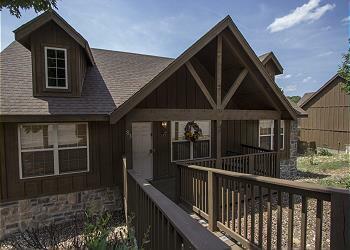 A Branson vacation rental could be just what you need! 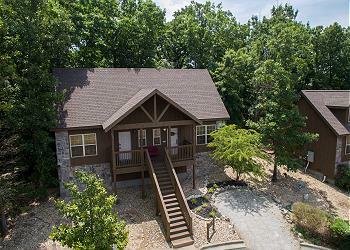 Rent our 4 bedroom, 4 bath Quiet Creek Cabin in the Stone Bridge Golf Resort Community and enjoy Rustic beauty and days spent on the Ledgestone Golf Course...each of the courses golf carts come with a touch screen GPS unit with which to navigate the yards and yards of lushly manicured greens. Ten of your best buds can join you on this guy’s vacation, golfing, grilling, playing basketball or tennis, fishing or even playing on one of the provided sand volleyball courts...a great time is promised to all! 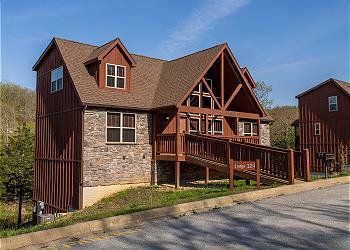 Our comfy and beautiful vacation cabins Branson MO are ready to welcome you and your family! Rustic and romantic, with wood floors throughout, it may be hard to tear yourself away from the stone fireplace that offers a warm place to cuddle and nap. 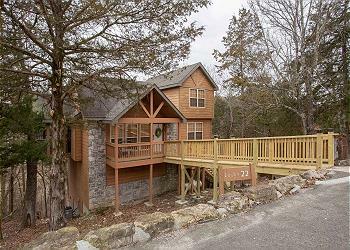 Magic Moments is a cozy one bedroom Branson vacation cabin that will be the ideal place to make magical vacation memories with the love of your life. Romantic meals will be made all that much more memorable when coupled with lakeside views at Charlie’s Steak Ribs & Ales. Wine tastings and tours of Lindwedel Winery allow you to sample and choose the exact wines that go with the sunset at your cozy Banson vacation cabin , while a hike on one of the many trails that traverse the Lakeside Forest Wilderness Area will give you a new appreciation for the deep soaking tub back at the cabin! Your grandmother is turning 90 and you’re looking for a Branson cabin rental that will hold your family; River’s Creek is a wood and stone cabin with 4 bedrooms, 4 bathrooms, and a two-story stone fireplace that will keep all 12 members of this birthday celebration warm and comfortable! Breakfast at McFarlain’s Family Restaurant will be a hearty one filled with smiles and laughter—especially if you are seated at one of the trick tables that rise up to your chin unexpectedly. Because eating out with 12 people can be an expensive and time extensive option, you will probably want to stop at Harter House so you can fix your own meals in your Branson vacation cabin. The meat here is tender, juicy, and hand-carved for your dining pleasure. Dolly Parton’s Dixie Stampede in Branson is a patriotic themed extravaganza that offers a meal and fun for people of all ages. The theater is wheelchair accessible; what a great birthday gift for Grandma’s 90th! A Branson vacation rental can only be topped by renting a Sunset Nightly Rental cabin; we are obsessed with offering only the best available! Charming, stunning, fastidiously clean, you will never be disappointed when you choose us! 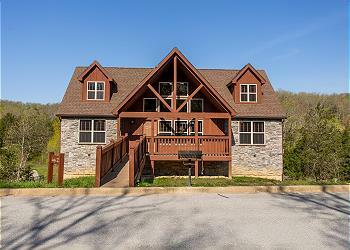 All of our cabins Branson MO are fully equipped and have flat screened televisions, cable, Wi-Fi and anything else you would need for the perfect getaway! Start planning your unforgettable Branson sabbatical today - you deserve a break!